This beautiful bling cross has an old world feel, quite ritzy and bold, yet elegant. The length of the cross is 1 ¾" and the width is ¾". The length of the chain is 16 plus a 3" extension. Solid Sterling Silver base with a white gold plating and genuine clear cubic zirconias. A perfect necklace for all occasions! 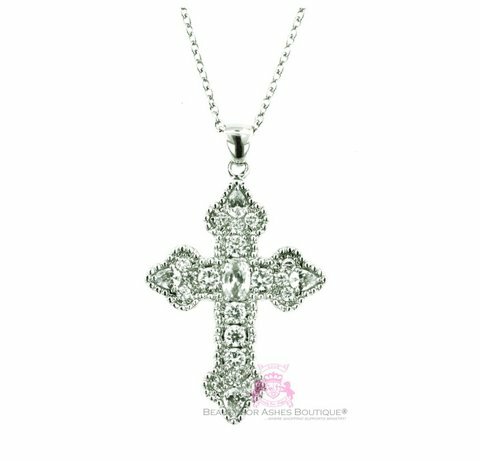 All our jewelry is anointed and prayed over to bless our customers; a blessing to bring forth your divine destiny and glory!